Well a couple of weeks ago, we were at it again. We went down to see what all new (old) things we could find at Treasure Spotters here in McKinney. 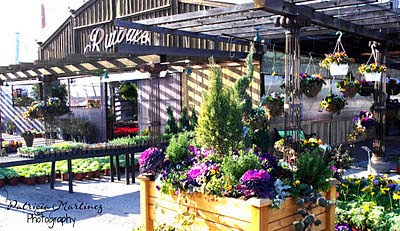 We didn't have much time, since we were also headed downtown to the Dallas Farmers Market (one of my favorite places) so we stopped by this really cool spot. I especially love this pink, chippy door! Check out these very cool rocker and chair set. I really, really want them!!! She has some awesome patio chairs too! After this stop we decided to go downtown to the Dallas Farmers Market. We hadn't been there in a loooong time. I just love shopping at Ruibal's nursery. Granted,this time I didn't buy anything, but in the past I have gotten some gorgeous begonias. The fruit and veggies vendors were all out and have so many varieties to offer. I particularly enjoyed this lady's stand. She had pickles pickled in so many different ways. From watermelon, to lemonaide, to red hot and spicy. Now you know me, I had to get me a spicy pickle! So fresh and crunchy and hot!! I then went over to this stand -Thompson's produce-where they sell raw honey. I love raw honey. And nuts. And as you can see they have so many varieties. I had to get me some cashews. After all this excitement we came home and got ready for a nice date. We got a nice gift card from our AT&T U-verse which gives us all kinds of options to spend! So we went to the movies and guess what we saw?! It was an awesome movie! Red Tails is the story of the Tuskegee airmen, an all black fighter pilot, squad that fought in WWII. It is filled with action and adventure. I highly recommend it.Our weekend was fun filled and peaceful at the same time. Just the way we like it. Now we are trying to find some other ways to spend the rest of our gift card. Isn't it fun when you get these types of things?